Finally there is a non-chemical way to treat the water in your home and get all the benefits and characteristics of soft water. Until now, if you had hard water problems, you had to buy or rent a costly salt ion-exchange softener or replace your plumbing and water heater periodically. The proven Genie residential hard water conditioner is chemical free, salt free, and the permanent healthy answer to your hard water problems. It is the only system on the market to incorporate both RF radio sine wave technology and DIC electromagnetic technology in the same unit. This by far makes the Genie Computerized Water Conditioner the most affective unit of its kind. You can pay allot more but you can not get a better salt free water conditioner. Prior existing scale is dissolved in the water. Scale is removed from your water heater and plumbing system thereby saving you energy and money. The United States Government reports that consumers save a minimum of 48% of their hot water heating energy dollars with the elimination of 3/8″ or more of mineral scale build-up. A family of four can save up to $750.00 per year with the removal of this costly, pipe clogging mineral scale. There are two technologies employed in the Genie Computerized Water Conditioner output – Radio Frequency and Direct Inductive Coupling. The very powerful microprocessor delivers an unparalleled 13000 varying low frequency pulses per second. It is this action that neutralizes the calcium carbonate particles ability to adhere and form scale. As the treated water flows through your plumbing system the water will reverse the scale forming process, disintegrating the build-up already present, and offer future scale prevention. Calcium carbonate naturally exists in two forms limestone and marble. Limestone has a number of impurities which are predominantly Silica, Alumina, and calcium sulphate which act as bonding agents. CaCO3 is only very slightly soluble in water, yet large amounts of calcium become dissolved in most water supplies. This is because as rain water falls to earth it encounters carbon dioxide and reacts with it to form a mild acid (Carbonic Acid). Thus as rain water comes into contact with limestone in the earth, the limestone dissolves and goes into solution with the water. Surface waters also encounter carbon dioxide from the decay of organic materials. As these waters contact limestone, the limestone gradually dissolves and goes into solution. Under close investigation of industrial systems where scale is formed, the scale is mainly Calcium Carbonate or Magnesium Carbonate but also Silica, Alumina or Calcium Sulphate are required as binders to make the scale form. The Genie Computerized Water Conditioner waveform changes the Ionic state of the molecules in the solution being treated. This physical ionic change repels Silica, Alumina and Iron which normally act as binders and make scale form. Free electrons are generated which allow Ca (Calcium) and Mg (Magnesium) to dissociate from CO3 (Carbonate), SO4 (Sulphate) and HCO3 (Hyrdocarbonate) and assume their neutral atomic states, thus stopping scale forming and removing scale deposits. On evaporation only neutral minerals form and any Calcium Carbonate left will form as neutral Aragonite instead of Calcite. The capability of the water to dissolve minerals will also be increased and this is the reason why hard scale layers will be softened, will slowly enter into the water stream, and will disappear down the drain. This means that you may have slightly more problems with scaling after the installation until all old hard scale layers have disappeared, which will take 30 to 90 days depending on how much preexisting scale was formed. If you have clean piping and live in a new house you will only see the beneficial effects. The Genie Computerized Water Conditioner is a water conditioning technology that physically changes the minerals in water to prevent them from forming scale. A traditional water softener replaces calcium and magnesium (known as “hardness”) with salt or potassium. Radio Frequency and Direct Inductive Coupling. The very powerful microprocessor delivers an unparalleled 13000 varying low frequency pulses per second. It is this action that neutralizes the calcium carbonate particles ability to adhere and form scale. As the treated water flows through your plumbing system the water will reverse the scale forming process, disintegrating the build-up already present, and offer future scale prevention. Calcium carbonate naturally exists in two forms limestone and marble. Limestone has a number of impurities which are predominantly Silica, Alumina, and calcium sulphate which act as bonding agents. CaCO3 is only very slightly soluble in water, yet large amounts of calcium become dissolved in most water supplies. This is because as rain water falls to earth it encounters carbon dioxide and reacts with it to form a mild acid (Carbonic Acid). Thus as rain water comes into contact with limestone in the earth, the limestone dissolves and goes into solution with the water. Surface waters also encounter carbon dioxide from the decay of organic materials. As these waters contact limestone, the limestone gradually dissolves and goes into solution. Under close investigation of industrial systems where scale is formed, the scale is mainly Calcium Carbonate or Magnesium Carbonate but also Silica, Alumina or Calcium Sulphate are required as binders to make the scale form. The Genie Computerized Water Conditioner waveform changes the Ionic state of the molecules in the solution being treated. This physical ionic change repels Silica, Alumina and Iron which normally act as binders and make scale form. Free electrons are generated which allow Ca (Calcium) and Mg (Magnesium) to dissociate from CO3 (Carbonate), SO4 (Sulphate) and HCO3 (Hyrdocarbonate) and assume their neutral atomic states, thus stopping scale forming and removing scale deposits. On evaporation only neutral minerals form and any Calcium Carbonate left will form as neutral Aragonite instead of Calcite. • How much does it cost to run? The unit costs less than $8 in electricity annually. • Will Genie Computerized Water Conditioner affect my water flow? Our customers often notice an improvement in water flow due to the elimination of pre exiting lime scale from their plumbing system. • We have high iron content in our water; will the Genie solve my iron problems? 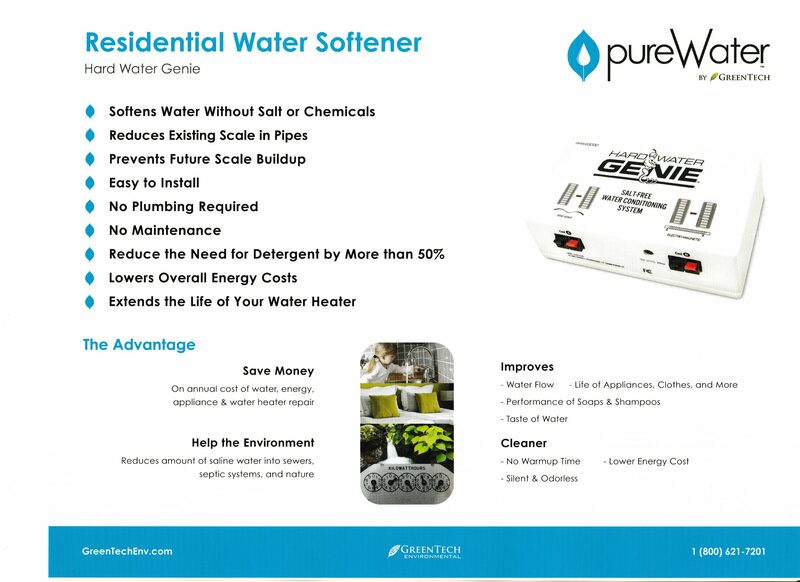 • Can The Genie be used with existing filter systems and water softeners? • Will I notice more lather from soaps, shampoos and detergents? 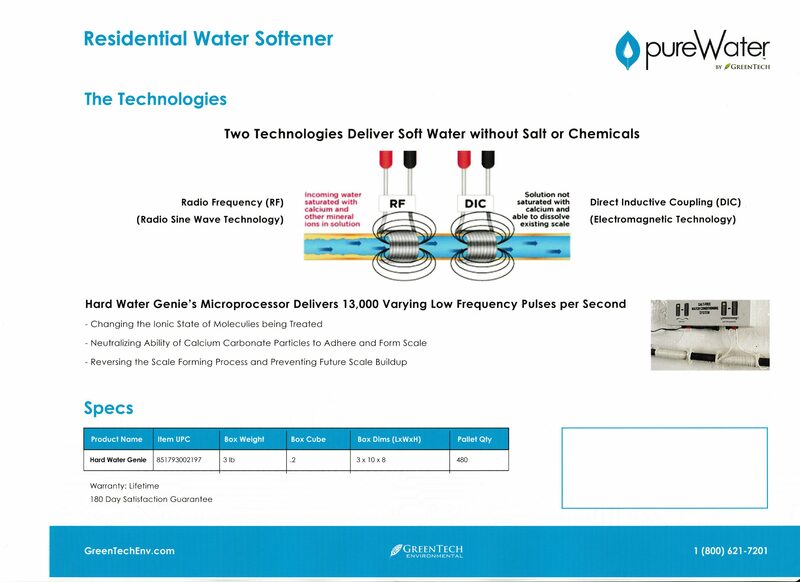 Water treated with Genie Computerized Water Conditioner behaves as soft water. Far less shampoo, soap or detergent will be needed. On average consumers experience a 25% reduction in the use of all detergents, shampoo and household cleaners etc. • How easy is it to install? Do it yourself installation is quick and simple – and does not require a plumber or the cutting of pipes. 2- Wrap each signal cable in the same direction 30x around your water supply pipe with a minimum of 2-1/2” between cables. 3- Connect the signal cables to the Genie unit and plug into 110 Volt outlet. 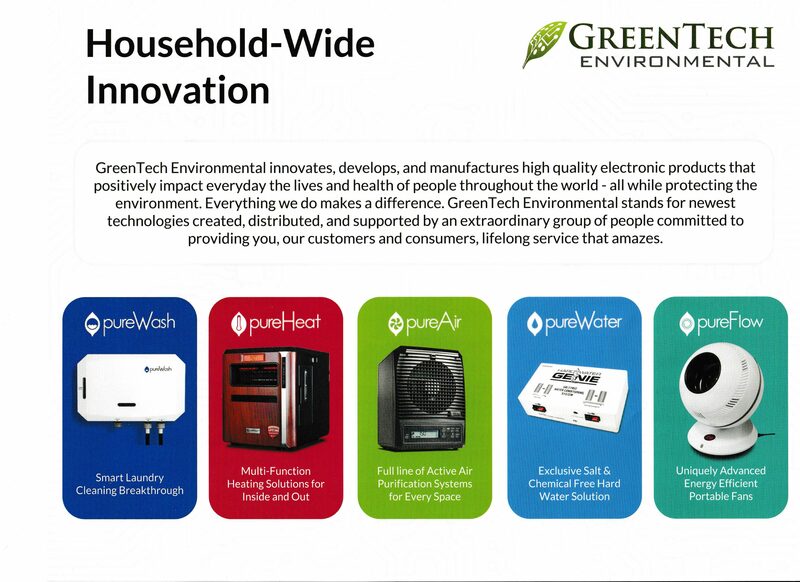 Easy installation also means that, should you move, Genie Computerized Water Conditioner is simple to disconnect and to take with you. • Will it work with any pipe material?